Today marks the inaugural release from The Glenlivet Winchester Collection: the world’s first series of rare and precious 50 year old single malt Scotch whiskies from the single malt that started it all. “Vintage 1964” is the first release from this exquisite collection, anticipated to become one of the most sought after and priceless whisky collections on the planet. Befitting its price tag, no expense or attention to craftsmanship has been spared in creating the perfect vessel to house it, with every element hand-crafted by artisans from the British Isles, from hand-blown glass, to the inclusion of precious materials such as rose gold and ‘Cairngorm Stone’. 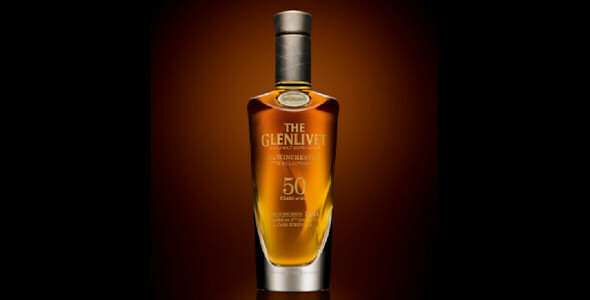 The spirit inside lays claim to 50 years of unrivalled knowledge, unwavering care and unfaltering craft, which started when decorated war hero, Captain Bill Smith-Grant – the last remaining descendent of The Glenlivet distillery’s founder, George Smith – laid down a specially selected cask in 1964. Carefully guarded and cared for by generations of The Glenlivet Master Distillers, this special cask was identified early on as being destined for greater things and has since been slowly and steadily developing the signature flavours that make The Glenlivet an enduring benchmark of quality. It is under the care and guidance of current Master Distiller, Alan Winchester – from whom the collection takes its name – that Vintage 1964 has been deemed ready to be enjoyed by only the most ardent and discerning of single malt connoisseurs. The first bottle of Vintage 1964 from The Glenlivet Winchester Collectiongoes on sale at Harrods this October, with a total of just 100 bottles then available for purchase worldwide. The next release from The Glenlivet Winchester Collection will be Vintage 1966, the launch date of which has yet to be announced. Customers can join The Guardians of The Glenlivet programme to find out more information. Visit www.theglenlivet.com/guardians.